There has been considerable enthusiasm – including on Nextbillion.net – about Tata’s much hyped Rs. 100,000 car. Nextbillion post – India’s Model T: Tata’s $2000 car out by 2008 – has been on the Most Popular list of posts for as long as I can remember! While some are enthused by the project – and others are not, what cannot be denied is that the Tata project represents a paradigm shift in the automotive industry. The project has been in the news because of its agressive pricing, controversies over land acquisition and its impact on traffic congestion and pollution. Urban planners might be appalled at what this could mean for traffic congestion and parking, but companies – and consumers – are raring to go. The first launch will be that of Tata Motors’ much-talked-about Rs 1 lakh car. But in just a couple of years, you might have half-a-dozen such vehicles to choose from. Nissan Renault on Thursday joined the bandwagon, unveiling plans for a $3,000 (around Rs 1.25 lakh) car for Indian roads. Nissan Renault is expected to team up with Indian manufacturer Mahindra & Mahindra to enter the sub-Rs 1.5 lakh segment in which the likes of Hero Group, Bajaj Auto and Maruti Suzuki, the original aam admi car manufacturer, have already evinced interest. Even Xenetis, a low-cost PC maker, intends to be in this segment. In February, Nissan Renault said they would build a factory in Chennai with Mahindra & Mahindra – India’s largest maker of jeeps and tractors by sales volume. The factory, expected to start operating in 2009, will produce mostly compact, low-cost vehicles and will eventually have the capacity to produce 400,000 vehicles a year. The passenger vehicle sales in India crossed the one million mark in 2005. This segment grows at 10-15% annually. Around 85% of the cars sold in India are financed as against the global average of 70%. 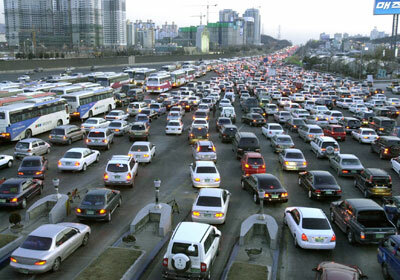 In neighbouring China,only 15-20% vehicles are financed. There are only three cars in India for 1000 people as compared to the other extreme of 500 cars for 1000 people in the United States. Goldman Sachs has predicted that India will have the maximum number of cars on the planet by 2050 overtaking the United States. Expect a big boom in the auto manufacturing sector as new players invest in setting up manufacturing facilities with its attendant supplier base and vendor development. Huge amounts will be spent in marketing and advertising these products in a market which has never seen such competition before. The challenge, for auto majors, lies in convincing a larger audience of the gains from this project. All in all, it augurs well for the Indian economy with a promise of higher employment, higher investments in financing and best of all – higher degree of choice for the aspirational Indian consumer.